Just got back to Whanganui. 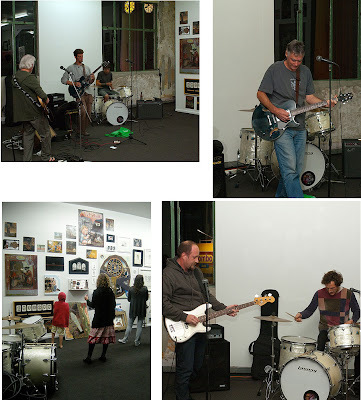 Here are some more photos of the musicians and bands that played at the opening. I didn't catch the name of the guys featured top-left, but top-right is Brian Campbell, renaissance man and below him, Naked Brunch (Jack and Tim). Thanks heaps to Jo and Phill for the photos. You can see more image on the PAULNACHE website here. Photos from Friday night's opening: general shot of the installation, me cutting the National cake with Gene Paul looking on, Matt Nache handing out food and another opening shot. 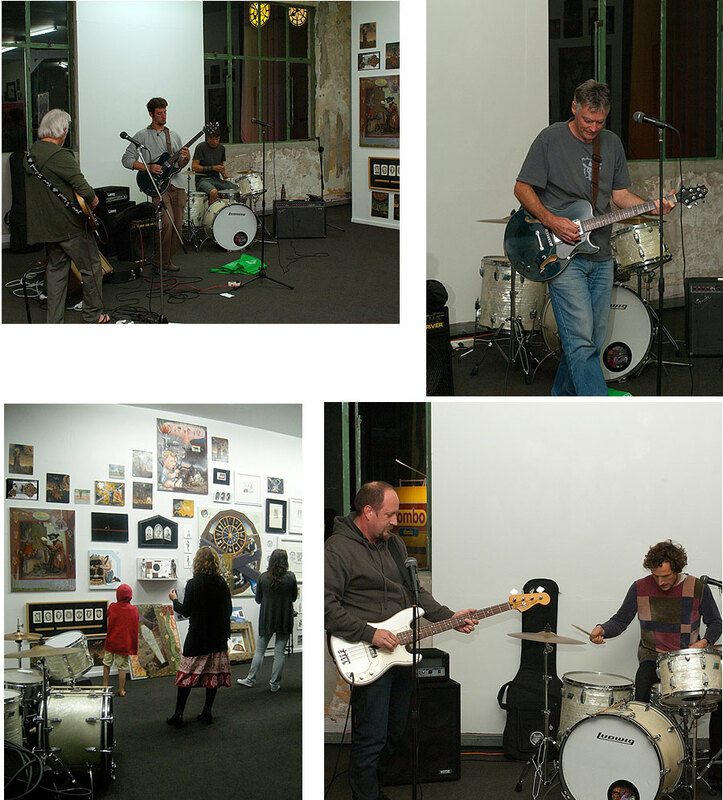 Last night, Matt Nache and Gene Paul of PAULNACHE in Gisborne surprised me with a farewell exhibition. Below is a stitched-together photograph of the main wall. 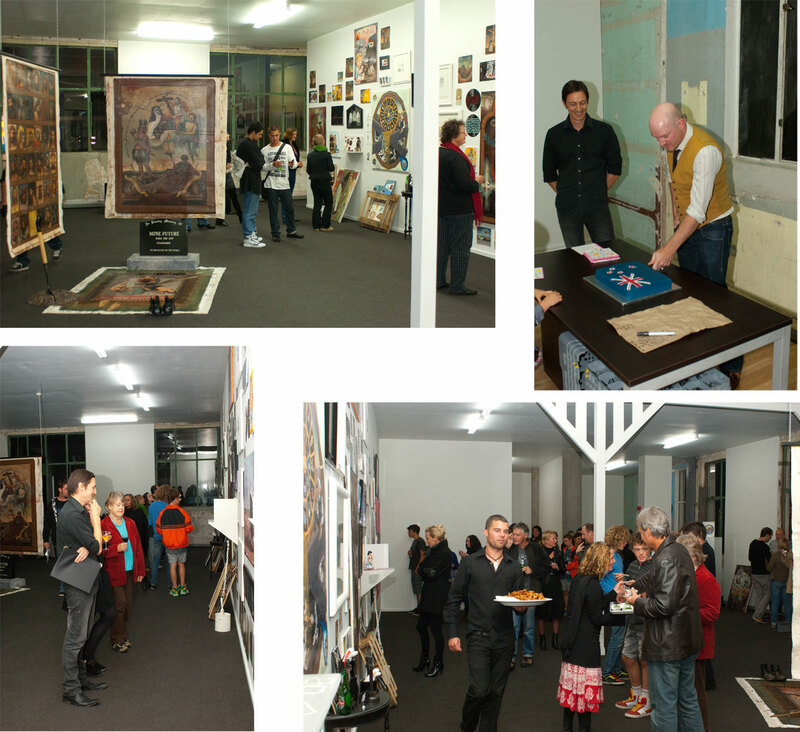 It was a total surprise to me and somewhat daunting walking into an exhibtion featuring twelve years of artworks! It was great to see all the Gizzy folk and a big thank you to all that made the effort to drive and or fly over to the opening event. I'll be posting more images over the next couple of days and will also be updating my website contents page in due course. I painted the work on the left in 1996 while on holiday in Hawkes Bay. There's obviously some link to my more recent work, My Ambassadors (right, 2008, oil on linen) as they both reference Hans Holbein's paintings. The earlier work on the right shows the skull on a table, unanamorphosised (if that is a word), yet I removed the skull in the later painting and replaced it with an anamorphic Huey Newton. I think I used the image of Newton as we were heading over to the USA just after this painting was exhibited and I'd been reading Soul On Ice by Eldridge Cleaver. Heading over to the East Coast today for some R & R, will post but they'll be delayed.